My research team tells me that no matter how many years people have been skiing, most are still insecure about the sport. Here are some of the reasons that we uncovered in our recent tax-deductible information-gathering trip to seven destination ski resorts. Insecurity is when your kid says, "Don&apos;t worry Daddy. I&apos;ll wait for you at the bottom." 1. You are midway between the two tallest lift towers when the chairlfit stops and all the chairs slide back 50 feet before the lift operator slams on the brakes. You bounce up and down the same way you did when you went bungee jumping. 2. You meet your private instructor who charges $420.00 a day for lessons and discover that she is two years younger than your youngest daughter. 3. You order lunch for two in the mountaintop restaurant with your new lady friend when you discover that you only have $3 in your pocket and no credit card. 4. You discover at 4:35 a.m. on a Saturday, while you are driving on an icy road 27 miles from your condominium, that the gas gauge is on empty. 5. You take up skiing after a 27-year layoff and are the only person in the quad chairlift line with leather lace boots, stretch pants, long thongs and a White Stag parka. 6. You are driving your van at 63 mph and nine of your pals are drinking beer in the back when you pass an unmarked, small-town police car on a two-lane road leading out of town. A few minutes later you discover that he was traveling at the posted speed limit of 35. 7. You are riding in a ski-patrol toboggan that is being steered by the prettiest lady you have ever followed down a mountain. 8 .You ski into the singles line at the quad and end up riding with your ex-wife, her weekend spousal equivalent and her jet pilot. 9. You are told by the ski-shop clerk that you just made a big mistake by buying the wrong brand of shaped skis for $699.00. 10. You separate your skis so they won&apos;t be stolen while you have lunch and then drink so much red wine that you can&apos;t remember where you put your second ski. 11. You give your wife an expensive ski suit for Christmas and then see someone at breakfast in your hotel the first morning wearing the exact same outfit in the exact same color. 12. You ignore the chain law and then discover that the Highway Patrol doesn&apos;t.
13. You buy new ski boots that are supposed to be comfortable but they give you black-and-blue toes after the first day of your week-long vacation. 14. You try to remember on a powder morning whether you said you would meet your wife at chair 10 at 11 or chair 11 at 10. 15. You admit that your kids are snowboarders. 16. You admit that you are a snowboarder. 17. You get to the ski resort and are unloading the car when you discover that there are only three skis on the roof: Your wife&apos;s pair and one of yours. 18. You drive 300 miles to get to the parking lot of Mt. Perfect and see that part of your favorite run is covered with a narrow strip of manmade snow bordered by streams of muddy water. 19. You dress for a sunny spring day, and then a blizzard arrives just as you get to the top of the mountain for your second run. 20. You buy snow tires and discover that they only work in the mud and are useless on ice. 21. You are taking the skis off of the roof of the car when your wife says, "I need a new pair of gloves," your son sulks away with his snowboard, your daughter says she wants to take a ski lesson from that darling new instructor who she met last weekend, you need to get your edges filed and they all want money from you for lunch. When you go to the ATM you discover it has run out of money on a Saturday morning and when you try to buy ski lift tickets for your family, the cashier tells you that your credit card has been declined because it is over its $10,000 limit. 22. You finally get to the top of the mountain, and you have to hold the trail map upside down to see where and how to ski down because the map was drawn as though you are looking up from the parking lot. 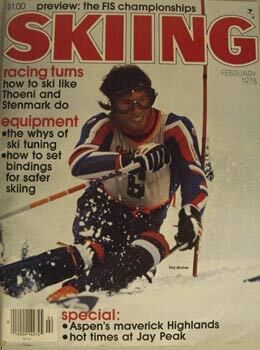 The shrinks will tell you, however, that the sense of insecurity is the real attraction of skiing. The act of hurtling brains-first down a snow-covered hill within inches of trees that can stop protruding parts of your body is the real draw. Therein lies the thrill-and the reward-for all your insecurities.